Artist’s impression of Bangarra Dance Theatre at Walsh Bay Arts Precinct. 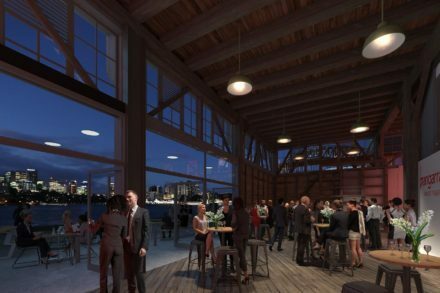 Work on Stage One of the redevelopment of the Walsh Bay Arts Precinct is set to begin now that the NSW Government has signed a contract with Richard Crookes Constructions. Demolition will begin immediately, with hoardings and environmental controls now being set up around Wharf 4/5 in preparation for the start of work. Once complete, the aim is to double the arts and cultural offering at Walsh Bay as well as helping transform the Sydney Theatre Company, Sydney Dance Company, Bangarra Dance Theatre and the Australian Theatre for Young People. As well as having the ability to house the Australian Chamber Orchestra and Bell Shakespeare at Walsh Bay. The NSW based firm, Richard Crookes Construction, has a track record in delivering a range of NSW Government projects across the health, education and justice sectors. Infrastructure NSW has invited the local community to attend a consultation session on 10 October to meet the project team, discuss the work and explain any changes (such as access routes) that will take place during the construction period.